This photograph was originally published in Burrows Guide Book which was printed c1920. The main feature is The Medical Hall and Pharmacy which was owned by AP Wallace. To the right of that you can see the entrance to Higgins’ Garage (he was an agent for Ford cars ), and to the right of that again, down a little alleyway, was the entrance to the Empire Theatre. 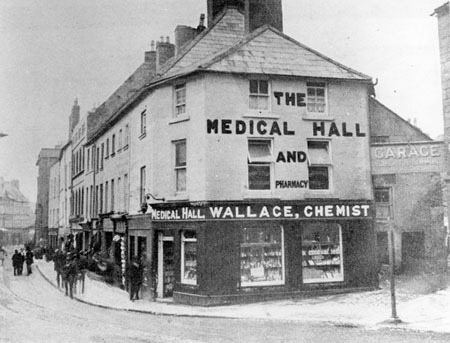 Mr Wallace was a pharmaceutical chemist who advertised “Doctor’s prescriptions were accurately compounded with the best drugs; Large assortment of patent medicines; Depot for the most up-to-date medical, surgical and toilet requisites; Photography a speciality, full stock of cameras, plates etc, developing and printing done on the shortest notice.” This premises was later taken over by Hills who converted it into a high class confectionery and fruit shop. Next door, we can see the sign for the entrance into the showrooms of WP Higgins, where there was accommodation for 250 cars. By 1926, Higgins’ were advertising the fact that the Ford was now practically a 100 per cent made Irish car, the only car made in the Free State. This, they hoped, would add an impetus to sales and make for greater employment in Cork. Some six years later, Mr Higgins announced that he had bought the site of the old Victoria Theatre in Victoria Place, and also the adjoining site of Moylett’s Yard. He intended to develop the two sites and open a spacious garage and showroom there the following year. So he put the William Street premises up for sale, together with the adjoining Empire Theatre which he had leased to Walter McNally. Together, these two premises comprised 17,287 square feet. Mr McNally had just purchased a site on Eglinton Street from Mr JT Costelloe of the Royal Hotel. There, he was planning to construct a new cinema/theatre which would eventually open as The Savoy. The Empire Theatre could seat 1,050 people and was ‘thoroughly ventilated’. The phone number was Galway 28, the manager was Harry O’Donovan, and the musical director was AE Glennon. They had a resident orchestra of seven or eight musicians who ‘played all the latest music’ in between films. On November 17, 1927, Galway’s first live outside radio broadcast from came from The Empire Theatre in aid of the national Relief Fund for the Cleggan Disaster. Conducted by bandmaster Paddy Griffin, St Patrick’s Band began proceedings playing ‘The Stars and Stripes’ by John Philip Souza. Though it was hastily arranged, under the musical directorship of Miss May Fogarty with the co-operation of St Patrick’s Band and the Empire Orchestra, it was deemed a great success. It was held under the auspices of the Chamber of Commerce which had persuaded the newly established radio station 2RN to broadcast live from Galway. Only the best pictures were shown, and there were four changes of programme weekly. On week nights, the show ran from 7pm to 10.30pm, and on Sundays it started at 8.15pm and there was also a matinee which started at 3.30pm at which they showed serials and the Pathe Tone News as well as the main feature. On Sunday, May 21, 1933, they were showing The Captain of the Guard which was described as an ‘all talking and singing picture’. The Galway Archaeological and Historical Society is getting the New Year off to an early start with the first lecture of 2010 taking place in the Harbour Hotel on Monday next, January 11 at 8pm. It will be given by Dr Nollaig Ó Muraile on the subject of Anthony Raftery, his life, legend, and legacy. A fascinating topic. All are welcome.